This project is all about dubbing the confession conversations for several characters in Fire Emblem Heroes, and it will be posted on my Youtube Channel. Before I go over any of the rules, I just want to state this: yes, FEH has a lot of characters, and yes, we are considering doing another Casting Call for more characters in the future. If you don’t see a character you like in this Casting Call, maybe you will the next time around. 1. Microphones should be Snowball quality or better, with little to no puffing, distortion, echo or background noise. 2. You may audition for as many characters as you want, but you will only be cast as one. However, there may be some exceptions if you sound distinct enough. 3. We highly recommend that you do two or more takes of each line! 4. My co-director and I will audition like anyone else, but we will not self-cast. Instead, we will ask others with knowledge of the characters to send feedback before casting. 5. Once you are cast, you have a 2-week deadline to send us lines. 6. Communication will be entirely over Discord. 7. The voice references are just references. Feel free to copy the original VA, or do your own original take on the character! Have any questions? Want feedback? You can contact me, (ディアドラ#3731) or my co-director, KikiLabyrinth, (kikilabyrinthva#9669) over Discord or CCC. Camus is a knight who vowed his devotion to his motherland, Grust. Caring to those he is close to. Devotion to one’s motherland is the highest calling. And the loneliest one. At first my isolation protected me from the pain of losing someone I cared about...or so I thought. But to allow that fear to prevent genuine connection with others is to rob yourself of their strength. 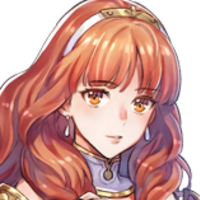 Note: You will also have to voice Fallen Heroes Celica! Celica is a priest to the Mother Mila, and wishes to resolve conflicts peacefully. Has a very close relationship with Alm. Tell me, is there anyone in your life who is essential to you? I was thinking about a childhood friend of mine. For some reason, we can never quite seem to meet up… Is it fate that keeps us apart? 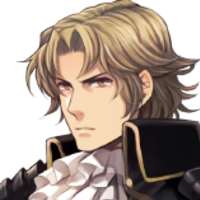 Reinhardt is a dedicated and devoted knight in service to the country of Friege. 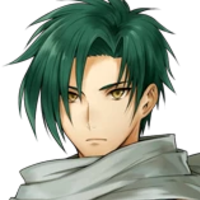 Cares for his younger sister Olwen, and admires the Summoner for their tactical skills. I have a younger sister named Olwen. She went her way, I went mine. There was a tactician so brilliant in my world that he was thought of as a god that presided over war. I must say, your command is perhaps as impeccable. You and I—different, yet fully committed. What an ideal way to grow—neither leading nor following, but walking together. Note: You will also have to voice Valentine’s Eliwood! 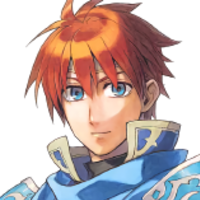 Eliwood is the son of the Marquess of Pherae, and is friends with Hector and Lyn. Kind, compassionate, pure, and totally not the co-directors favorite character what are you talking about. I can tell you're the type to push yourself too hard. So please, take care. Thank you for your guidance in all matters. It gives each and every one of us the confidence to fight. I take special courage from knowing you. It's as if you're a beacon of hope. I feel as if I could overcome any obstacle, and I have too rarely felt such strength.. 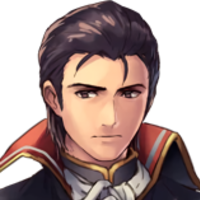 Note: You will also have to voice Valentine’s Hector! 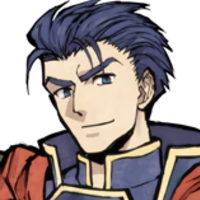 Hector is the younger brother of the Marquess of Ostia, but cares more for sparring with his best friend, Eliwood, and probably annoying Lyn. Push your limits—that's what I say. But don't burn yourself out. Someone once told me that knights should stand their ground, but that's really just not my style. Then I noticed how you, as tactician, see the line between life and death like no one else. Not sure why, but that hit me hard. Anyway, know that I've got your back—long as you've got mine. Note: You will also have to voice Bridal Lyn, Brave Lyn and Valentine’s Lyn! 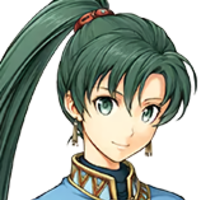 Lyn is very tomboyish and does not care for politics, even though her noble background says otherwise. She’d rather be near her true home, the wide and open plains. I grew up on the plains, so I'm pretty direct. Still, I have manners. Just not...etiquette. I may look calm—maybe even still. But I'm really very focused. It's part of my daily training with my sword. But while I'm at it, I should also thank you for giving me courage and never failing to be kind. Those are rarer qualities than you'd think. 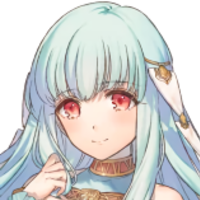 Ninian is a half-human/dragon dancer who comes from a place where dragons are shunned. Wants both humans and dragons to live together in peace, like long, long ago. Humans and dragons… Do you accept both as they are? I know many dances—those for any occasion and a few for special ones. Care to see some? You have the rare gift of seeing others, or at least me, as if there are no divisions between us. I appreciate this more than you can know. One of the Black Fangs’ elite assassins, known as the Blue Crow. Only gives her loyalty to those she sees as “perfect”. Ursula, Blue Crow... No matter the name, the end is still the same. I find you perfect in so many ways and so wonderful to serve. But if you get too tired...? Well, I'm just saying that your flaws would start to show. And we CAN'T have that. I have no friendship to offer you. Nor will I take any. It would be an insult to the both of us. Why, what are two friends but a pair of failures who've merely agreed to cover for each other? 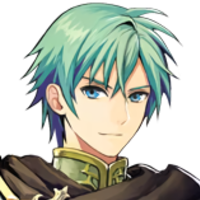 Ephraim is a prince, but cares more for fighting and battles. 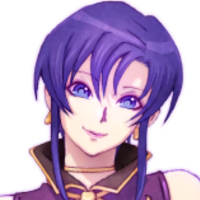 Loves his sister, Eirika, b-but in a totally platonic way, of course! Here's some advice. Let the fools spread gossip. The rest of us have work to do. You know, I once had ambitions to be the greatest spearman on Magvel, the continent I call home. Strength can also blind one to others' feelings. That is exactly how I once lost a good friend. I must become kinder and more compassionate, or else I risk repeating my mistakes. 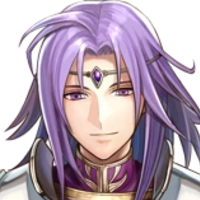 Lyon is the prince of the Empire of Grado, and was corrupted by the Demon King after trying to save his country from despair. Used to be caring, kind, and gentle. Former friends with Ephraim and Eirika, who he respects dearly. Death was coming for us all. I just wanted to save everyone. But where… where did I go wrong? You work so hard, but I want you to know that—if you need to—it's OK to cry. Nobody here knows what you've been through but you. Note: You will also have to voice Brave Ike and Vanguard Ike! 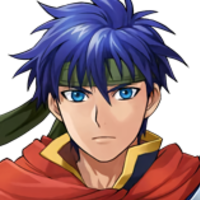 Ike is a very inexperienced fighter and leader, but he takes care of both positions for his father’s mercenary band, the Greil Mercenaries. Cares deeply for his friends. As a commander, I'm green as they come. But I do my best. Those I fight with...they're family. But you hired me—rolled the dice that I might help you do great things here. You believed in me, so I'm glad to give my all for you. 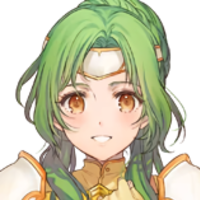 Elincia is a princess of the kingdom of Crimea, but was sheltered to the public. Despite what you may think, she knows how to take care of herself and others, and wants to pay back people who do the same to her. Could I perhaps ask for your help in practicing for battle? I must do my fair share out there. Ah, no, it's nothing... Forgive me. If I can help even a little, then that is the path I choose for myself. I no longer have doubt about that. Micaiah, one of the founders of the Dawn Brigade, is a secretive girl with mysterious powers. Very close to Sothe, who she treats as a brother. The visions I see spreading out before us... We're meeting others and forming bonds... And we're fighting side by side. I was thinking... While I'm here, I can be my true self. Here, my past has no hold on me. And when I think that... I can't help but wish that I could stay here forever. Even now, I can't reveal everything about myself or my powers. Someday, though... I'm certain I'll be able to tell you everything. Sothe is the second founder of the Dawn Brigade. 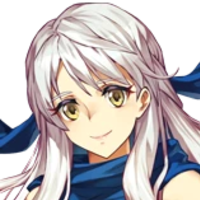 Isn’t that warm to others, but is to Micaiah. I may not have any special powers, but I've been told I have a fire inside. One look at you and I can see that you're exhausted. If our tactician is about to keel over... What does that do for morale? When I was a kid, Micaiah took me by the hand. All she wanted was for me to not have to cry anymore... She held me tight. That's when we became a family. 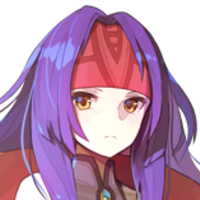 Sanaki proclaims herself as the Empress of Begnion, and that she can speak to “the Goddess”. In reality, she is a stuck-up brat who feels that it is an honor to be in her line of sight. A summoner, you say? How wonderful—the stuff of fairy tales! I think you might be a bad influence on me. How curious. I wonder what it means.. Note: You will also have to voice Spring Lucina, Masked Marth and Brave Lucina! 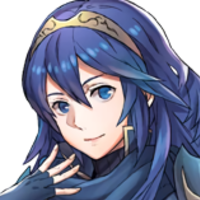 Lucina is a princess of Ylisse, and comes from a bad future where the world is destroyed. Went back in time to try to save her home. Deeply values her friends and hope for the future. If I had to choose between peace and the lives of my friends...? Hmm. My world and everyone I knew were destroyed by the fell dragon, Grima. I can never allow that future to be. This world is a truly beautiful place. The white castle, clear blue skies... and all the flowers, of course. They are, all of them, irreplaceable. Note: You will also have to voice Halloween Nowi! 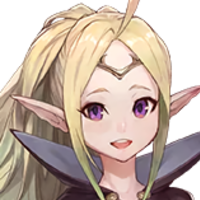 Nowi is a dragon girl that looks young, but is actually 3,000 years old. Treats others like younger siblings. I may not look it, but I'm actually older than you. Heehee! I was alone for a long, long time... But after I joined Chrom’'s army, I have lots of really fun friends! I love playing with you—you're nice and you're fun and I feel safe with you. Hm? Aww! How sweet! Well, if that's how we both feel, let's stick together forever and ever! Shiro is a determined fighter, and always want to practice sparring and protect those he loves. 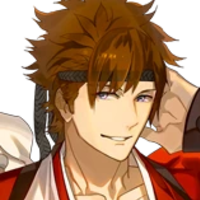 Wants to grow up and best his father and inherit his sword, Raijinto. I always try to fight the strongest foes I can find, but I don't try to take them on alone anymore. I want to keep fighting by your side. I know you're not much of a fighter, but how about we test your strength? You can arm wrestle, can't you? I've really come to admire your type of strength. So I'll make up for the fact you can't fight like the rest of us. If you ever need help, just give me a holler and I'll come running.